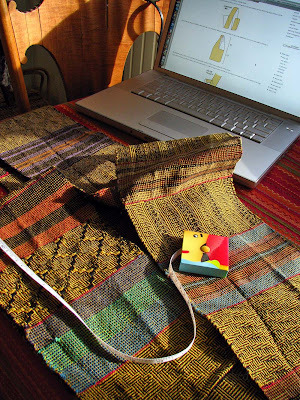 This bag, woven in shadow weave was inspired by a blog post at doni’s deli, and is now being interpreted by many in our weaving group. I think that Barb is up to 4 different versions. It is a simple construction; all one long strip and folded cleverly, to magically be sewn into a simple bag. So magically simple, that I had to go to Doni’s blog post again, to figure out just how to sew it. 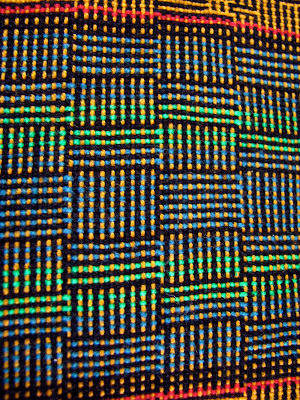 Sewing not being my strong point, actually I despise it. Imagine my surprise in returning to read Doni’s blog (I’m addicted) and seeing our bags and other similarily addicted bag makers featured. It is fun to see the connections that can be made through this internet world. 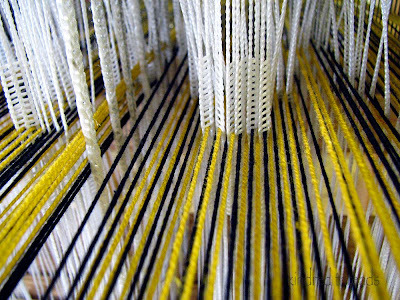 I wove enough for 2 bags and they took me forever, weaving with 2 shuttles is a pretty slow process. 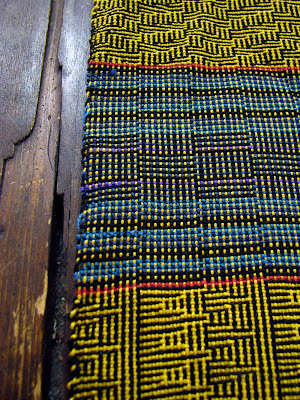 The areas that are plain weave were faster except for the deciding what colors came next. 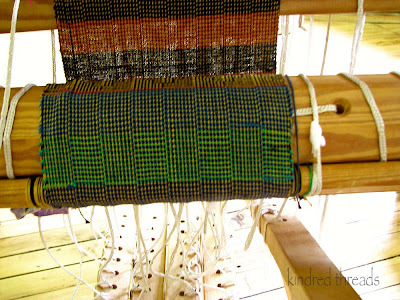 Handwoven magazine has had several articles on kente cloth that I have always wanted to try. 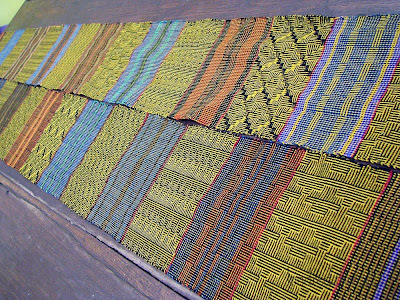 The fearless use of color in these african textiles will, I am sure inspire many more weaving projects. So, can anyone explain to me how I can be weaving along just fine and then start to struggle with one of the treadles and finally look underneath the loom and see that one of the treadle cords is winding up with the cloth beam. One of my more creative, “how the heck did I do that”. All in all a rather rewarding project. 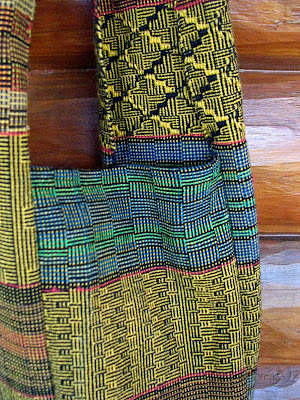 There is nothing like walking around carrying something handwoven so you can oh so subtley say that…yes I am a weaver. I tried walking up and down main street with one of my rugs, but that got old. 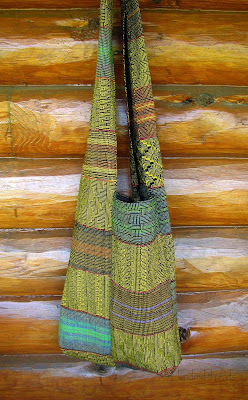 This bag is just fantastic!I love the colors and the pattern, they are perfect. And this is really a smart way to make a bag, I have to try this some day. You have done a great job by making all the squares the same size, they match perfectly. Thank you for a very inspiring post! I can't wait to see the bag that you come up with. That is half the fun; how different everyone's is.